This used Clymer repair manual is Volume 1 of 2 covering 56 models of 3-wheelers and 4-wheelers spanning 1974-1987. Featuring just as much detail as our ATV model specific manuals, this repair manual will give you everything you need for repair and maintenance. 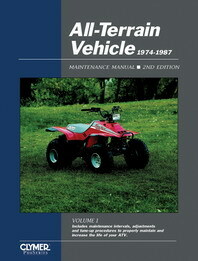 Clymer ATV repair manuals are considered to be the only ATV repair manuals worth owning. They are used by some of the most prestigious professionals to your average everyday ATV owner. Along with superior design Clymer ATV repair manuals always provide the most up-to-date information available for your ATV. Clymer manuals provide step-by-step procedures based on the complete disassembly of the machine. This hands-on experience combined with extensive research results in a manual that is both detailed and user friendly. Accurate, clear and concise text, combined with detailed illustrations and photography, make it possible for the novice ATV enthusiast to safely and enjoyably service their vehicle. At the same time, the in-depth coverage provides indispensable information for those tackling more complicated procedures. Models Covered: Honda ATC70, TRX70, ATC90, ATC110, ATC125, TRX125, ATC185, ATC200, ATC200X, TRX200SX, ATC250ES, ATC250SX, TRX250 and TRX250X. Kawasaki KLT110, KLF110, KLT160, KLF185, KLT200, KLT250, KXT250, KSF250 and KLF300. Suzuki ALT50, LT50, LT80, ALT125, LT125, ALT185, LT185, LT230E, LT230S, LT230GE, LT-F230, LT250E, LT250EF, LT250R, LT300E, LT500R and LT4WD. Yamaha YFM80, YT125, YT175, YTM200, YTM225, YFM200, YFM225, YTZ250 and YFM350XT. Polaris Scrambler, Trail Boss, Cyclone and Trail Boss 4x4.